If you have an interest in Photography chances are one day you’ll want to convert one of your images to black and white to achieve that atmospheric and intense look. The actual process can be as easy as clicking a button, but what are the best ways to make your photos black and white in Photoshop? In this post I’ll cover some of the popular techniques and describe which methods give the best results. First, let’s take a look at some of the common mistakes people make when trying to turn their photos to black and white. 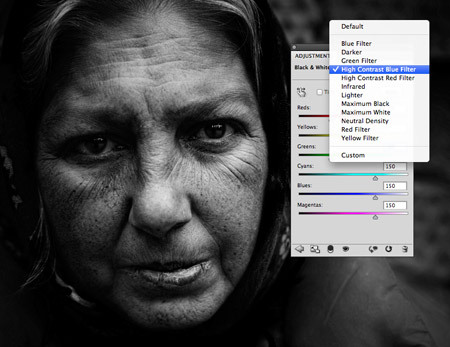 Image > Adjustments > Desaturate or sliding the Saturation level to zero in the Hue/Saturation options are two methods that quickly achieve a black and white effect, but this method is far from ideal. Desaturating an image simply removes the colour, but isn’t that what we want? Well, not really! A photograph is made up of various tones. When you desaturate an image it removes all the colour information and makes all areas of the image that are the same brightness or contrast the same shade of grey. This results in a flat and washed out looking image. 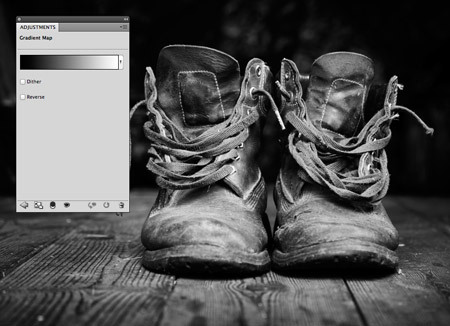 Another quick and dirty method to converting an image to black and white is to change the image mode to Greyscale. This yields similar results to Desaturation, where the image is left flat with low contrast. 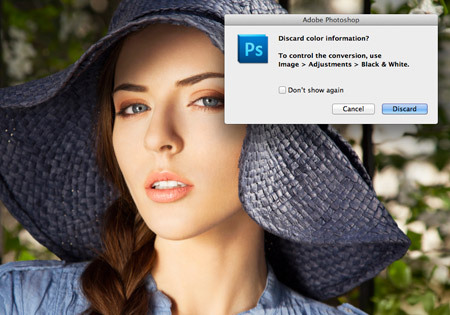 Photoshop even warns you when attempting this and recommends you use the Black & White conversion for more control. So, we’ve covered what not to do, now let’s take a look at some techniques that will leave your photos looking great. The classic Photoshop black and white conversion technique is to play around with the Channel Mixer. These days the Channel Mixer can be found as an Adjustment Layer as well as under the adjustment menu, which helps keep this conversion non-destructive. The previous methods above discarded the colour information, but with the channel mixer you can finely control the tonal range of your image. Check the Monochrome option then move the Red, Green and Blue sliders to suit. Keep an eye on the total levels though, if you exceed 100% it means you’re blowing out some of the whites. 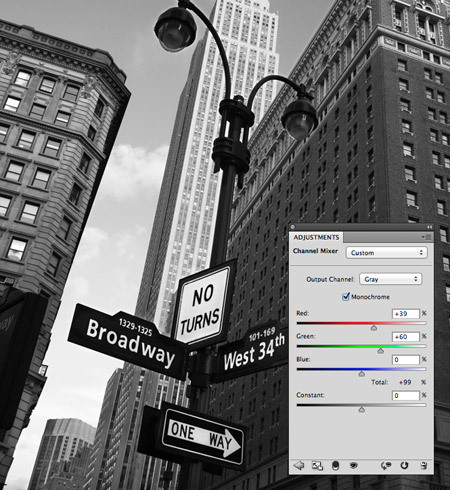 Introduced back in Photoshop CS3, the Black and White adjustment (and adjustment layer) is a tool based on the old Channel Mixer method, but with a few more options. The Black and White adjustment layer gives you all the same channel controls as the Channel Mixer, but also allows you to add a tint for a cool sepia effect or cold horror movie tones. The Black and White adjustment layer also provides some default settings such as High Contrast Blue Filter, which can give you a head start when creating those intense black & white images. If you’re wanting to quickly make your images black and white, but don’t want to faff around with loads of fiddly slider controls you might want to try out the Gradient Map. The Gradient Map doesn’t remove any colour information, it just replaces it with a colour value from your chosen range. So if you select a black to white gradient the Gradient Map will swap the original colours for a grey tone of the same brightness, which helps maintain the overall contrast of your image. What’s more, you don’t have to stick with pure black or white, choose a dark blue and a creamy white for some cool vintage style film effects.